When asked why I support Freedom Project and why I volunteer in the prisons, the simple answer is, “I was called to this work.” This calling arose out of a need to do something about the great amount of pain I observed in our world. Everywhere I looked I saw people suffering, whether through poverty, hunger, loneliness, isolation, shame, guilt, or fear. I began to see the prisons as a microcosm of the world. I knew it was unlikely that I could change the world, but I could certainly invest my time and energy in one specific place and make a difference. As I met with the men and women who were incarcerated, I began to see that regardless of which side of the barbed wire fence we were on, we are all in prisons, mostly of our own making. I call them the prisons of the mind – false beliefs about our unworthiness and unloveableness. And I became aware of the walls that we build to convince ourselves we are safe – if we have a gun or a big bank account; if we are a member of a gang in prison or a country club in the suburbs. The men and women in the prison taught me all this. They held up a mirror to me that showed me that suffering is no respecter of color or education or money or upbringing. I literally had to go to prison to gain my freedom. 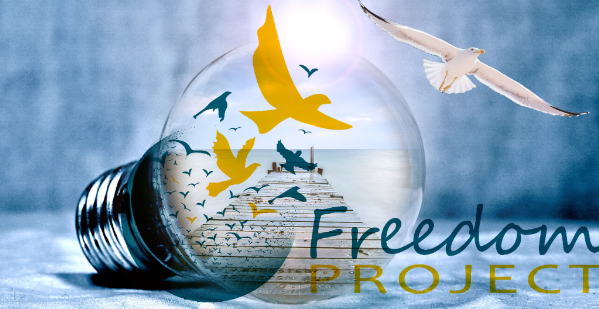 So I support Freedom Project, this great organization with heart that allows me and others to go into our prisons, not with an agenda to fix someone, but rather with the full understanding that we are all One and we are all in this together. We live in a throw-away society, but I am hopeful that we are learning that we cannot afford to throw away people. I cannot be safe if you cannot be safe. It is our intention to create the conditions and hold the space where we can discover and nurture our own human nature. That’s when transformation occurs. That’s when miracles happen. It is exciting to be part of a team that is helping make our prisons places of hope and healing. I am very proud of our well trained volunteers, our dedicated and responsible Board, and our professional staff. We are dedicated to service. There is a difference between helping and service. Helping is an experience of strength; fixing is an experience of mastery and expertise. They are both very personal. Many things need to be fixed. When we help, we see life as weak; when we fix, we see life as broken. Service is the work of the soul. When we serve, we always serve the same thing. We are servers of the wholeness and mystery of life. Only service heals. As a long time Freedom Project prison volunteer and Board member, I invite you strongly encourage you to remember Freedom Project by going on the Seattle Foundation GiveBig website Tuesday, May 6th. All gifts will be doubled. ← GiveBig Campaign May 6 – Making a Difference!